Somewhere in the frigid wilderness of Siberia, Russian scientists are working on a dangerous new weapon. At the same time, the Kremlin is forming bold new alliances that might mean global war. There aren't many options left for the U.S. If they want to know what the enemy is developing, they'll have to insert a single operative. Nathan Adamson is a former SEAL, now a member of CIA's Special Operations Group. He's been doing dangerous work for SOG for many years now, and it has cost him. He has no family, and no attachments. Save one. Sophia. A nearly hundred-year-old veteran of the French Resistance. She is his friend, confidant, and mentor, with a few secrets of her own. When Nathan is deployed into Siberia, Sophia is left alone. Her mind is slipping, fading. Haunted by ghosts of long-dead enemies, she withers away in obscurity. Until a news story reveals one of those old ghosts never died. Sophia's past and Nathan's present collide. They'll have to lean on each other to survive. Even as the world races towards war, these two spooks will find a common enemy, one that could push the world beyond the brink and into self-destruction. 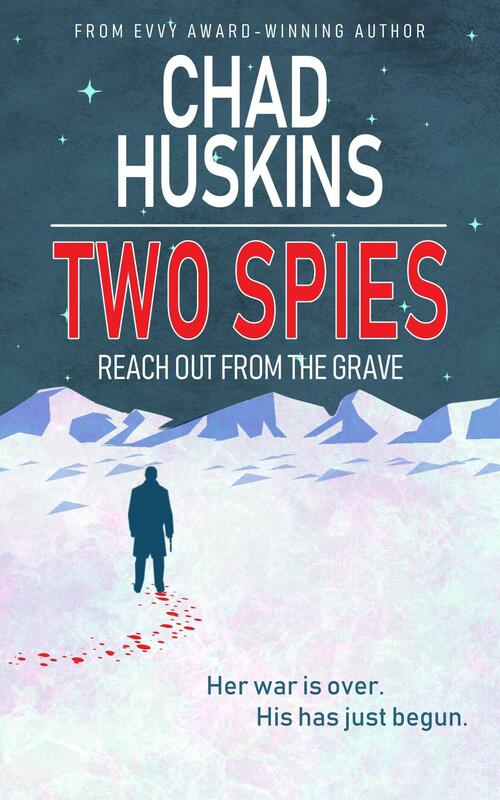 "Two Spies Reach out From the Grave" is that rarity, a boy's own adventure with a super spy – implanted earpiece giving him a window into the world – combined with modern-day geopolitical intrigue and treachery. Nathan Adamson careens around the world, sent in on impossible assignments in impossible places, while a very old (actually very, very old) ex-French Resistance spy, Nathan's friend, unearths secrets from the past. Chad Huskins writes in a clipped yet fulsome, "right there in the middle" first-person style that works brilliantly, with no friction whatsoever between one place and the next, and kinetic fight or flight scenes. Characterisation is surprisingly deep for such a novel. I loved the varied locales lit by a torchlight of battlefield intrigue, and the author's knowledge of the arcane world of the modern spy seems amazingly complete. There is a sense in which the plot grows absurd, but as with the MI franchise, you go with the flow, just to follow our hero and heroine to the double-crossing end. A vibrant new entry into a genre mostly filled with forgettable heroes and battles. See these hands. See them. Lined and cracked. With tracks etched jaggedly across aging flesh, channels cut by the rivers of time and use, avoiding only the hardened knuckles. Pronounced veins that begin to press against the skin, a roadmap with no beginning or end, no destination at all. Hands that might’ve built a house, might’ve held the hand of an admiring daughter, might’ve thrown the baseball to an adoring son. Might’ve. Those are all possibilities. These hands didn’t do that. They were put to other use. These hands clutch the weapon they were told to clutch. These hands know it well. The cold steel that is more familiar than a lover’s touch. Feel it. The weight of it. Its purpose. A cold, inanimate object that will do nothing ever again unless it is acted upon. Unless the trigger is squeezed. Unless the hammer falls. The mind is at ease with this, both knowing and not knowing. The mind and the hands are aware of each other and not aware of each other. Acting with both autonomy and concert. The gun presses to its victim’s head. The hands have been here before. They don’t tremble like they used to. Not even age can make them tremble. Not yet. That will come later. Along with the doubt, but the doubt is the mind’s burden, not the hand’s. The hand has to do the pointing and the squeezing, but it doesn’t have to do the suffering and the doubting. He doesn’t know that this doesn’t matter. It can’t matter. The mind has already decided this. It did so long ago. Every person the hand has killed at the behest of the mind has been someone’s child. That being true, many children have been slain by the hand. It can’t matter now. If it matters now it should have mattered then. And that the mind cannot bear. Besides, the mind says, most people over a certain age have children. If we spared every evil person because they had children, then evil persons would only make sure they had several children, as insurance. We can’t let children be shields for them. The mind knows this. The mind has rationalized. The mind has decided. “Make the call,” I tell him, handing him the cell phone. With shaking hands, he takes it. With shaking fingers, he dials. His hands have not been here before. Neither has his mind. He thinks that dialing the number for me might postpone this, grant him a reprieve. Maybe his killer will have mercy on him for it. Appreciate it. I won’t, but he is free to think that if it gets him through the next few minutes. He holds the phone to his ear. I can hear it ringing. I hear someone pick up. He speaks quickly back and forth. The words are not my native tongue, but I understand them well enough. And I listen for any obvious codes. I can’t detect any. He tells the person on the other end that everything is okay, the shipment was received, and that they should carry on with their plan. Then he starts speaking faster, and mutters wabakhai a lot, which in Pashto can mean either excuse me or I’m sorry. Slightly different meanings. If it’s the latter, he may be trying to apologize for his betrayal. Can’t take the chance he’s about to say that. He’s speaking faster and faster, I’m having trouble keeping up. I take the phone from him and hang up. The person on the other end will just have to assume the call was dropped. “Good,” I say, and place the phone in my pocket. The silencer makes the pistol’s shot a whisper. Brain and skull fragments splatter against the wall. His head snaps forward. The body crumples into a heap. The air smells sweet with cordite, and the coppery aroma of fresh blood. It’s a strange thing. Someone taught him how to walk, how to talk, how to read and write, how to add and multiply. Someone was there at his graduation. He had someone who loved him. Probably lots of someones. People he wanted to reconnect with, people he wanted to apologize to. Once the trigger is squeezed, you take all that away from them. Grocery lists forever unbought, apologies forever unspoken. You do that. You. When you pull the trigger. Now I’m replacing the pistol in my tactical hip holster. Now I’m taking one last look at the body. Cool embers of confusion and hatred still live in those dead eyes. I don’t linger on it. Stepping away, I make my way out of the building. Same way I came in. No searchlights. No raised voices. Just the dark, unending fields of takirs. Dried crust that forms with huge cracks on the desert surface. Behind me, the half-crumbling stone house rests quietly. A couple of lights in the upper floor. The children he spoke of. They’ll find their father in the morning, in the basement, a hole in his head. They won’t know why. The mind says this is normal. It says that I was also confused when my father died of a heart attack, also asking why. The mind says a lot of things. I’m out here with nothing and no one besides the wind. The bushes all around the oasis whisper conspiratorially. Crickets chirp, searching for mates, warning off competition, fighting a battle of survival that came before Man and will surely outlast him. I try calling the Nest again. No answer. Just me and the wind and the crickets. The house is now a glowing dot in the distance, resting atop a small hill and beneath a starry sky. Nothing like an Afghan sky. Zero light pollution. Orion is climbing over the eastern horizon, so I can tell without looking at my watch that it’s a little after 2100 hours. I give the Nest another call. Nothing. Still silence. This could get dicey. If I can’t contact the Nest, then I’m alone. Comms between me and my people at the Nest are like the tether that keeps an astronaut from drifting too far away from the spacecraft. Left out there too long, that drift may become extreme. You won’t be coming back. Lost with all the other detritus under the sand left by other wars, tanks and jeeps abandoned when a sandstorm proved too problematic, piles of arrows and bullets and even artillery left in deserts and mountain ranges because it was cheaper than shipping them all back. It can be easy to be left behind. Any tool can be left, if it outlives its usefulness. Not like it would be hard. They pick us for our disposability. Toss one of us to the side, who’s really gonna care? They made sure no one would care before they picked us. Part of SOG selection. Probably the number-one criteria. They don’t let you know what all the criteria are, but that’s probably one. I wait to hear the verdict. Am I alone, or is there a hawk coming to take me away? Never can tell. Situations are always fluid. There was a hawk ready when I first set down, but things change. Between then and now, a sandstorm might’ve been conjured up in the west, something could’ve gone wrong politically, might be an enemy bird materialized out of nowhere and is scanning the whole region, or some idiot forgot to clean the sand out of the hawk’s engines. So, I wait. Am I hoofing it, camping out in the desert mountains, eating snakes and goats for weeks on end? Or do I have help coming? I’m prepared for either. And now it’s a waiting game. And so I wait. I wait with my back pressed against a boulder that’s probably been here since the last Mongol invasion. This boulder’s seen it all. I’m nothing new. Just another passerby. Just another participant in a war beyond reckoning. I wait with Orion. With Rigel, the star that’s his foot. Rigel, nine hundred light-years away. Older than both me and the boulder. It’s just us guys out here. Me and Orion and Rigel and Betelgeuse and the boulder. A dead body is two mikes east of me. A body I made dead. Just us guys out here. I hold up my hands. See these hands. See them. Still not shaking. When I hear the whup-whup-whup of the helicopter, I hunker down, and prep for a quick take off. It’s over fast, and without ceremony. I’m inside my steel angel and it is delivering me from this wasteland of contempt and age-old vendettas. I get a pat on the back from the gunner. I’m inside the steel angel with other men who have been sweating and living inside their body armor for weeks. I’ve never met them before. They don’t know me. They came to give suppressive fire in case I needed it. I strap in. Sunrise. A ribbon of fire ignites the eastern horizon. We head for it. And now we’re landing back at base. And now I’m at a preliminary debriefing with the colonel and others. CIA rep is there, too. A new Homeland guy, as well, overseeing my operation and others for the Secretary of Defense, who had direct operational control the whole time. The power to pull the plug on it if necessary. To cut ties with me and leave me out there, too. The whole time I was out there, there were other people deciding my fate. Even the president had involvement. My name fell on his ears. Well, not my real name, just “Ageless Fox.” He and I will likely never meet, and he’ll never know which American’s life he held in his hands for Operation FAST SPIN. Now I’m being asked to write up a report, which will be included in my team’s after-action review. The purpose of an AAR is to let my team and others reflect on lessons learned, so we can all do better in the future. I’m lying in my bunk during my first reading of my team’s AAR, where I discover that there was a moment when the whole operation was almost scrapped. While I held my gun to the head of the American defector, while his family was upstairs not knowing he was on his knees pleading for his life, while my mind was justifying the kill, while all that was going on there was a hiccup from our PAG. The Political Action Group hit a snag trying to get permission from the Afghani government to allow the Chinook to take flight on what was deemed “standard reconnaissance.” It was a close thing, it all very nearly fell apart. Then one of our Afghan informants called in a favor for us. No one is clear what happened, whether a threat was made or not, but the Marines got their go-ahead and I got my steel angel. And now I’m on another helicopter, heading to Forward Operating Base Arian in Ghazni Province. Now we’re sweeping over the arid lands and crossing the Kabul-Kandahar Highway, flying low enough to frighten a man and his children and their herd of goats. One of the children waves at me. I wave back. Now I’ve landed at the ISAF base. It consists of Polish and U.S. Army forces. I nod amiably to everyone, but I don’t salute. I don’t know any of their faces, and I won’t try to remember any of them. Because I’m not here to stay and after only a night’s rest I’m off again. On a C-130 with cargo, medical supplies, and a group of Marines headed to the ancient city of Bagram to relieve some of Task Force Phoenix stationed there. I don’t know any of these guys, either, but they see that I’m alone and guess what I am. They don’t ask questions. They know not to. My job has me bouncing around like this, and my peripatetic lifestyle means I encounter people in small doses, getting little vignettes of their lives and never the full novel. We chat about baseball. I’m from Atlanta and there are two other Braves fans among the soldiers. One of them thinks the ol’ Bravos have a chance this year. I’m skeptical. We touch down during a windstorm. Not a bad one, but the crosswinds buffet us down the two-mile-long runway. When I step off the plane, I can just make out the control tower and the two snipers stationed up there. Now I’m reporting to the CIA handler on site and shaking hands with the team that’s been fighting on my behalf behind the scenes to grant me windows of opportunity, and creating an environment in which I can operate. U.S. Army Colonel Gibbs and CIA analyst Aaleyah Omar headed up the Nest this time, and coordinated with various branches to both insert me and extract me. There are other CIA spooks here to greet me, and a medic to ask me about my health, and someone from Homeland Security I’ve never met. These names and faces I will have to know, even if our relationship is short-term. They’ve read the AAR and my personal summary. They say they’re very impressed. The Secretary of Defense is happy that the operation went off without a hitch. They’re going to let me rest a night before filling me in on other matters I need to know about. Which means I probably won’t hear many more details about the mission. My part is done. Now I’ve got my own room, about a quarter-mile away from Bagram Airfield. Every few hours there’s a plane landing, bringing supplies or reshuffling soldiers around the country. Next to my room a couple of soldiers are laughing, I think playing cards, and blasting Dr. Dre’s The Chronic. I was, what, twelve, thirteen years old when that album came out? Heard it for the first time riding in the back seat of Sid Baker’s car on our way to a Falcons game. We ran out of gas on the way home that night, had to call Sid’s parents. We joked all the way home. I smile, remembering. Wonder where Sid is now? Think last I heard, he got married to Debbie Gilmore. Hard to see him as a family man. I walk outside, sand whipping around me. There’s Orion. Rigel and Betelgeuse are brightest. It’s just us again. Just us guys. That’s nice for a while. I go back inside and lie down on my bed. It’s comfy. I remember the first time I laid on a bed like this one in Afghanistan. I thought to myself, This makes it permanent. When they start shipping you super-comfy beds to bases in the middle of nowhere, you know the occupation isn’t going to be a short thing. They’re in it for the long haul. Like Orion and me. In the distance I can hear the pop-pop-pop of guys at the gun range. Putting the time in. Killing boredom. Tomorrow I’ll be on a plane headed for Dubai. The day after that, I’ll be on another plane for the States. I try to think on that as I wind down for the night. Home. It grants some small peace. I can still hear Salam’s plea before I shot him. I have children. I have three children. See these hands. See them. Steady as a rock. So why does the idea of killing myself seem so appealing?